So now, here I am in a nice 80x25 with a trusty vim executable autosaving every keystroke and backing up what I write...without really giving me any say at all. Kaia and I are in SF for the summer - She has a summer internship at a tech company in the South Bay. I'm spending my summer hanging out with a laptop in cafes in the Mission pretending (not?) to be a hipster. I get asked about my computing setup fair bit. (Often, 3-4 times a day. More, even, than I get asked for help connecting to cafe wifi.) My blog's been feeling somewhat neglected. Documenting the bits of my cafe-haxx0ring setup seems like it might be a reasonable solution to help me kill several birds with one hunk of text. The laptop is a Retina MBP. It is, indeed just a little bit unweildy. If they'd come out with a 13" Retina Air, I'd have bought that. Yes, the screen is gorgeous. It's got a lot of very small pixels. It's fairly glare-y, but nowhere near as bad as a last-gen 15" MBP. It's nice to have the screen real-estate, so I can keep a regular-size browser and a terminal up next to each other, which was a little tight on the Air that's now pretending to be an Apple TV. The new machine is blisteringly fast. (No, it runs fairly cool. It's not actually blistering. Just blisteringly fast.) I haven't actually managed to max out the machine's physical memory just yet. And with a comfortable environment set up, I still have well over a terabyte of space left. Somewhat tellingly, I find that I still mostly work with a single window maximized. More often than not, it's an iTerm 2. Admittedly, it's a terminal with incredibly crisp text. I developed serious (but SERIOUS) RSI at a relatively early age. Spending a lot of time on a laptop keyboard seems to do me in pretty quickly. Consequently, I've been traveling with a separate keyboard for quite a while. I've been through just about every ergonomic keyboard known to humanity as well as a few that nobody's ever heard of, but that's a topic for another day. 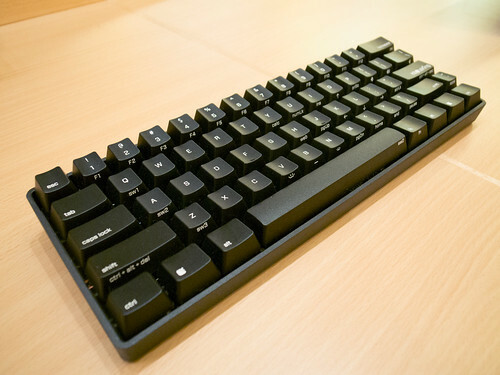 Right now, I travel with a KBT Pure keyboard, made by VorTex in Taiwan. It's a happy-hacking-esque reduced footprint keyboard with Cherry Brown keyswitches. Thanks to the small size, nothing is ever very hard to reach. The keys also light up purple, but that's neither here nor there. It's well made and incredibly comfortable to type on. I have some quibbles with the default key layout, but they're nothing that can't be solved with some judicious remapping. The most important change I made was a trick I picked up from the emacs set -- That key to the left of the A. You know. The one typically used only when someone is WRONG ON THE INTERNET. Some folks remap it to another Control key. I'm perfectly happy with Control living down toward the bottom of the keyboard. About 3 months ago, I remapped Caps Lock to Escape and I haven't looked back. It's great. In general, I find the most comfortable place to type is with my hands resting in my lap. The Pure is small enough that I can't easily balance it on my legs. A little bit of poking around Amazon turned up a...well, it's a piece of aluminum with neoprene on it. It turns out to be pretty much ideal. (It's a Grifiti Deck 13 Lap Desk.) They also make a decent wrist-rest sized perfectly for the Pure: Grifiti wrist rests. IMAK SmartGloves help keep my hands in a reasonable semblance of the right position for typing without losing feeling in my pinkies. I've been wearing them when typing fairly religiously for...a lot of years now. I'm pretty sure that Artur was the one who turned me onto them. The laptop tends to live on a table. The keyboard is often a bit hard to see when it's hidden away under the table. I'm told that I look like I'm typing with THE POWER OF MY MIND when I'm focused. Sadly, it's just the power of mechanical keyswitches and a USB cable. The laptop is usually propped up. Just a couple of inches makes typing on a laptop much less of a pain in the neck. My go-to laptop stand has been a Cricket (or one of the cheap knockoffs available on Amazon) for the last 5 or so years. The name comes from the fact that the original was a pastel green and when mostly folded up, it looked...well, ok. It looked a little bit like a stylized reproduction of a cricket. Lately, I've been test-driving a pair of small pieces of aluminum made by Latosta. They're much, much lighter than a Cricket. And they're more portable. The big downside is that out of the box, they don't raise the laptop nearly as far as the Cricket does. I suspect I'll either mod them or find myself back in cricket-land soon. (And, in fact in the 24 hours since I wrote the first draft of this post, I'm back to the Cricket and my neck is much happier. Well this certainly turned out to be a bit of a product shilling, which wasn't what I...actually, yes, it's exactly what I intended. I haven't talked about the tablet, phone, tabletphone hybrid, headphones, backpack, chargers, pen, paper notebook, keyboard case or the pound of cables and adaptors I cart around. If enough people prod me, I'm happy to do so.